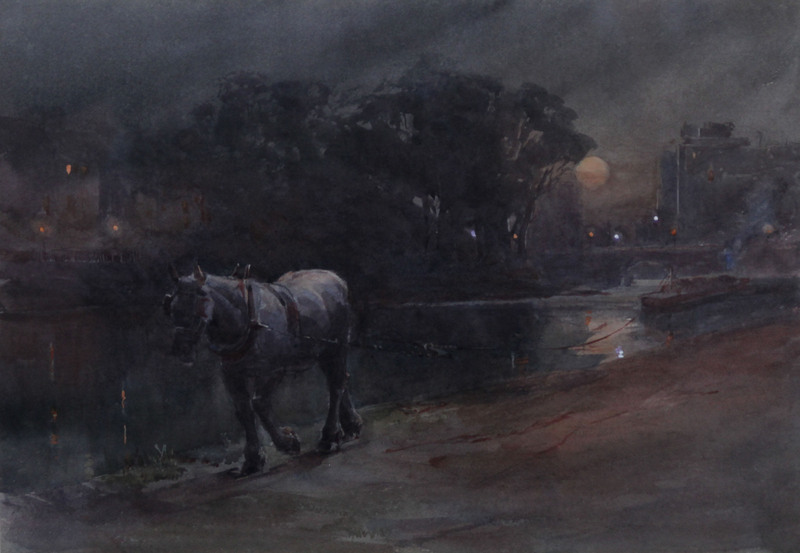 A beautiful Victorian nocturne industrial watercolour by Arthur Hopkins which dates to circa 1890. In outstanding condition, the colour is excellent. A super painting depicting a city canal at night with a horse dragging the barge lit by moonlight and gaslight. 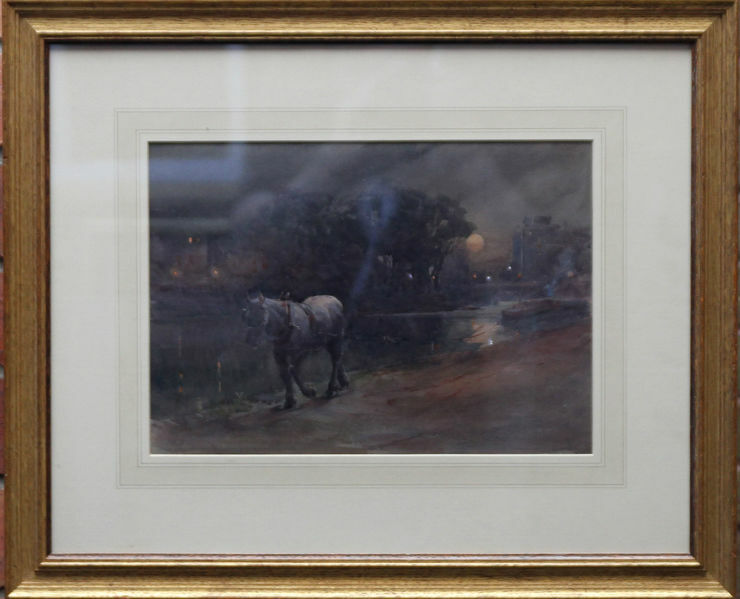 A beautiful Victorian watercolour housed in a gilded oak frame. Swept frame 25 inches by 20 inches, In good condition behind Victorian glass. Arthur Hopkins (1848-1930) was born only eight years after Hardy and lived to the age of 82. Hopkins was the son of a prosperous marine insurance agent and was born in Stratford, London. He was educated at Lancing College in Sussex, and, after graduation, worked in a London office before entering the Royal Academy schools in 1872. He exhibited in various London galleries, chiefly that of the Royal Water-Colour Society and that of the Royal Academy, but over twenty-five years also contributed illustrations to The Graphic, Punch, and The Illustrated London News. He was made an Associate of the Royal Water-Colour Society in 1877, and a member in 1896. His brothers were also graphic artists: Everard (1860-1928) painted in watercolours as well; Edward was a black-and-white illustrator; and Gerard Manley was a fine draftsman (as well as a renowned poet). Arthur Hopkins' genre scenes of country life are in much the style of another Hardy illustrator, Helen Patterson Allingham. He was a member of the rising generation of illustrators influenced by du Maurier and William Small, and, as Forrest Reid remarks, was "a good draughtsman, with "a strong dramatic sense, to which is added a sense of character".